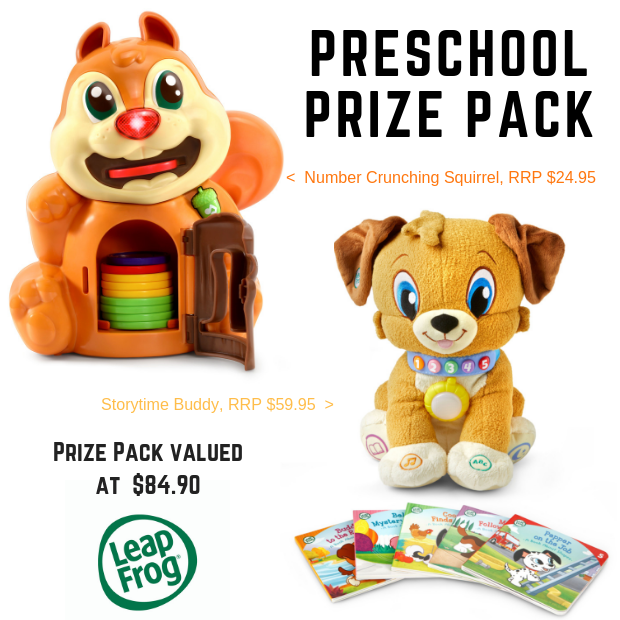 WIN – It’s almost Christmas and I have two awesome prize packs to give away thanks to LeapFrog Australia. LeapFrog have some awesome toys for our little humans this Christmas. There are options for our tiniest family members all the way up to kids in their first few years of school. And with prices starting at $24.95, there are options for most budgets. For a run down on some of the best options for your tech savvy tots head over to my LeapFrog – Top Toys for Christmas Post! And in 25 words or less which prize pack (Toddler or Preschool) you would like to win and why? Competition ends 8 December 2018 at midnight and full T&Cs can be found here. Let’s face it. It doesn’t take much to entertain my toddler. Would be nice have Mummy’s car keys back and for her learn something new! Reviewed toys: Safari Learning Playspace and Leap Builders Fix It Truck. Toddler pack – get my little one thinking whilst playing to give him a good start. Hi Amanda, the toys reviewed are Safari Learning Playspace and Leap Builders Fix It Truck. My overly enthusiastic preschooler has a great enthusiasm for life! I’d love to channel that leaping ball of something into education…wish me luck Amanda! Little miss has her eye on the Dino’s Delightful Day Book, so I would love the toddler pack for a creative and fun learning experience! Preschool prize: An interactive toy that is as fun as it is educational. Preschool prize: Love that Storytime buddy would read an amusing story to Little Miss while I bond and breastfeed baby. Reviewed toys: Safari Leatning Playspace and Leap Builders Fix It Truck. Leap Builders Fix it Truck and Safari Learning Playspace. My kids would love the Leap Builders Fix It Truck, it would keep them engaged as they learn, and they can have a truck just like their grandpa. Pre-school – looks a ‘Class’ act and ideal for learning and having fun! Leap builders Fix it Truck and Safari learning Playspace were tested. I’d love to win the toddle pack for my nephew to improve his learning and development! LeapBuilders Fix-It Truck and Safari Learning Playspace were reviewed- thanks. I would love the Toddler pack please. My fourth child (now 8 months) was a bit of a surprise, so many of our little kid toys are long gone. The preschool pack. Little Miss has been so patient with the birth of her little sibling, but patience only stretches so far when you’re three and you want someone to read your stories. This pack would be a gem for her – and for me – allowing her to be told some tall tales while still allowing my hands free to look after the newborn. Little Miss has been patient with the birth of her sibling, but patience only stretches so far when you’re 3 without a preschool pack. Leap builders fix-it truck and safari learning play space. I’d love the toddler one for my granddaughter , she love having tea parties. And she keen to learn and touching everything. Her big Brothers keep saying buy her her own toys. Leap builders fix-it truck and safari learning playspace. Providing hours of joy each day. Toddler back, because I’d love my toddler nephew to grow up loving books as much as Librarian Auntie Jess, and dinosaur books sure help that! I love seeing my children play together. They enjoy counting and a hearing a good bedtime story. This prize covers all favourites. Leap builders fix-it truck and Safari playspace. I’d love to win the Preschooler pack for my two nephews. A cheeky Squirrel and a loving Buddy would suit their personalities perfectly! We would love the preschool pack as there is one toy each for my children to share to learn to read and learn to count. Answer – Leap Builders Fix-it Truck & Safari Learning Playspace. Playgroup only runs for a few weeks. I’d love everyone to continue a regular catch up at my house. We’ll need fun educational for that! Leap builders and safari learning playspace. The toddler pack would be perfect for my daughter as we are learning our colours and counting. Little O tested out the Leap Builders Fix it Truck and Baby J the Safari Learning Playspace. It was the Leap Builders Fix-it truck and Safari Learning Playspace. I would love to win the toddler pack as it looks like my daughter can have alot of Education fun and squeals with these products. Leap Builders Fix It and Safari Learning Playspace. My 15 month old would LOVE the Toddler pack. We are always looking for educational toys to keep her mind and hands busy. Preschool pack. As my grandson grows his keenness to learn grows too, his imagination has expanded and it’s truly a delight to watch him play. I hope to win the toddler pack for my baby. It will be her first Xmas and I can’t afford any presents this year. Safari Learning Playspace and Leap Builders Fix It Truck were the 2 toys reviewed. 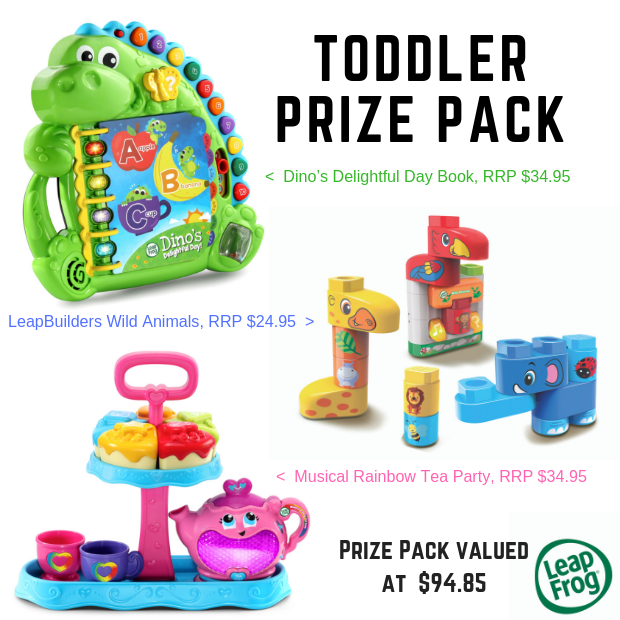 We would love to win the toddler pack as enjoy having musical tea parties with wild animals who help pass the time by reading about delightful dinosaurs! I would like to win the toddler pack as it looks like it will keep my little monkey entertained for a while! Leapbuilders fix-it truck and the safari learning playspace. Having a “DINO” might time. Leap builders and safari learning plays pace. Please consider our family for the Toddler prize pack. Our little one would enjoy a tea party with Gran and making animal noises is fun. Leap Builders and Safari Learning Playspace were the two you reviwed. Both look like great fun! I’d love to win the toddler pack for my two littlest grandsons when they come to visit Nanna and Pa! What lovely toys for our little darlings. I can see the fun that my Great Grand child would get out of these.